Happy Fitness Friday! 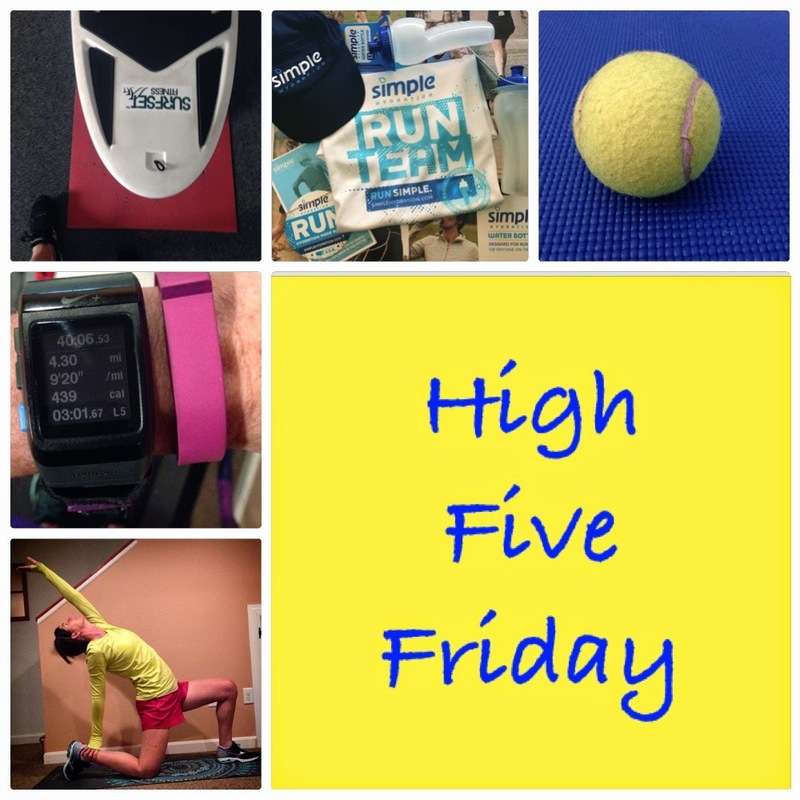 Today I'm joining my friend Angela at Happy Fit Mama and taking a moment to High Five some of my favorite February moments. Despite the snow storms and frigid temperatures, so many great fitness things happened this month. I'm sad to see February end because it means my winter vacation is also over, but I'm excited to see what March will bring (including warmer weather, hopefully!). 1. Doing more yoga to improve my stretching routine and focus on the muscles that are clearly too tight. 2. 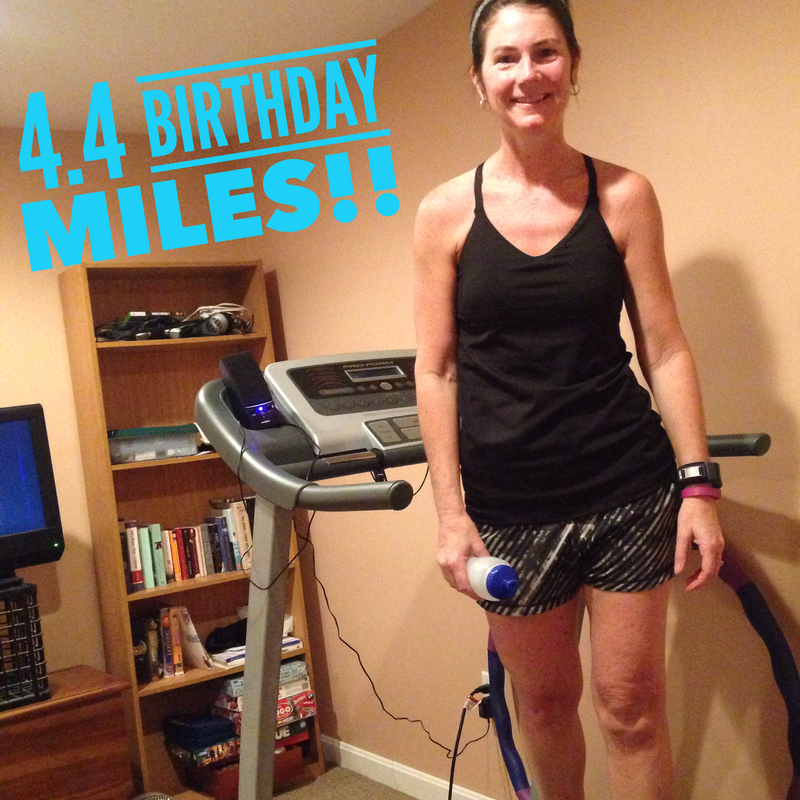 Longer and longer runs plus my first treadmill tempo. It's a work in progress, but I'm looking forward to maybe doing it once a week. 3. 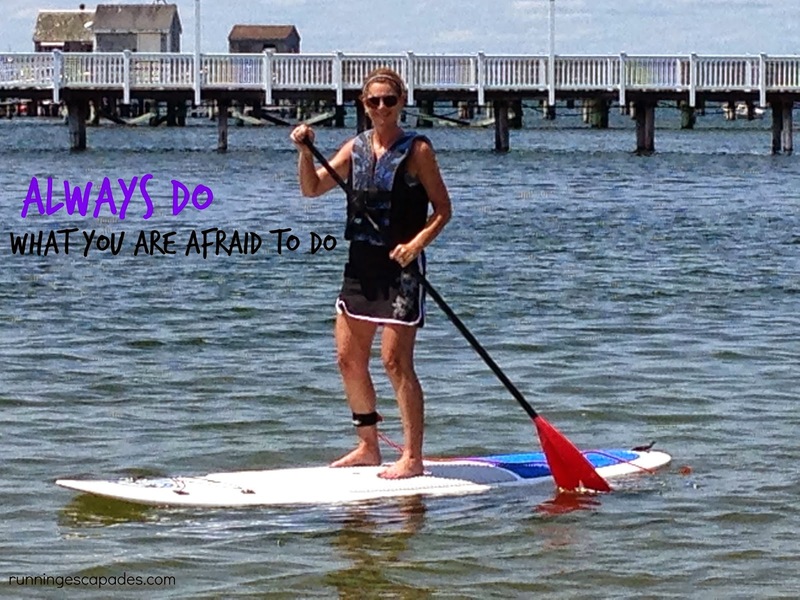 Getting back to SurfSet after a two month hiatus from knee surgery. Highly intense strength training is addictive. 4. Joining the Simple Hydration Run Team. Best water bottle. Great group of people. 5. My new favorite recovery tool: the tennis ball. I'm amazed at how much better my TFL feels after digging into my glutes with that thing. 1. Thoughts That Every Runner Has During A Run - just a fun read. 2. Always #LikeAGirl - the commercial that got things fired up for female athletes. 3. 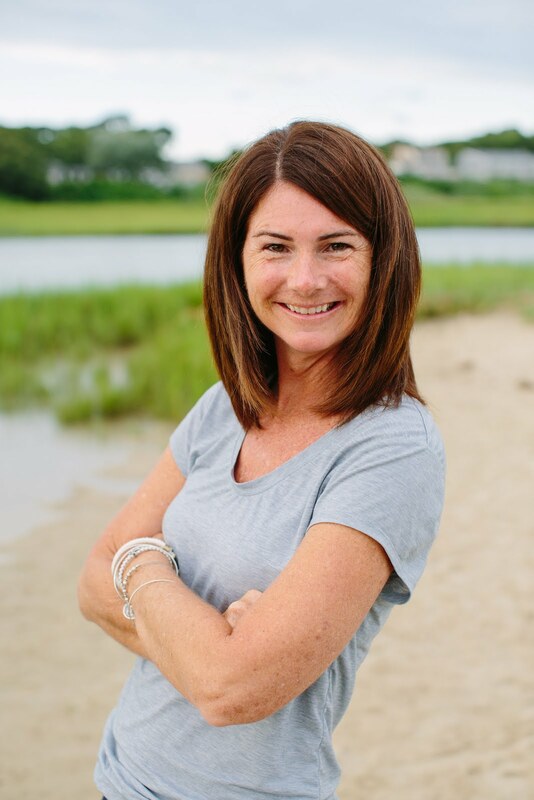 Meet The Boston Marathon Bombing Survivor Who Lost A Leg -- And Then Became A Runner - an amazing story about the journey from that fateful day in 2013 to the finish line in 2015. 4. But You Don't Look Like A Runner - runners come in all shapes and sizes, duh! 5. Oiselle Plans Flagship Retail Store in Seattle - I'm really hoping they consider opening another one on the east coast next…like maybe Boston?!? What do you want to High Five today? 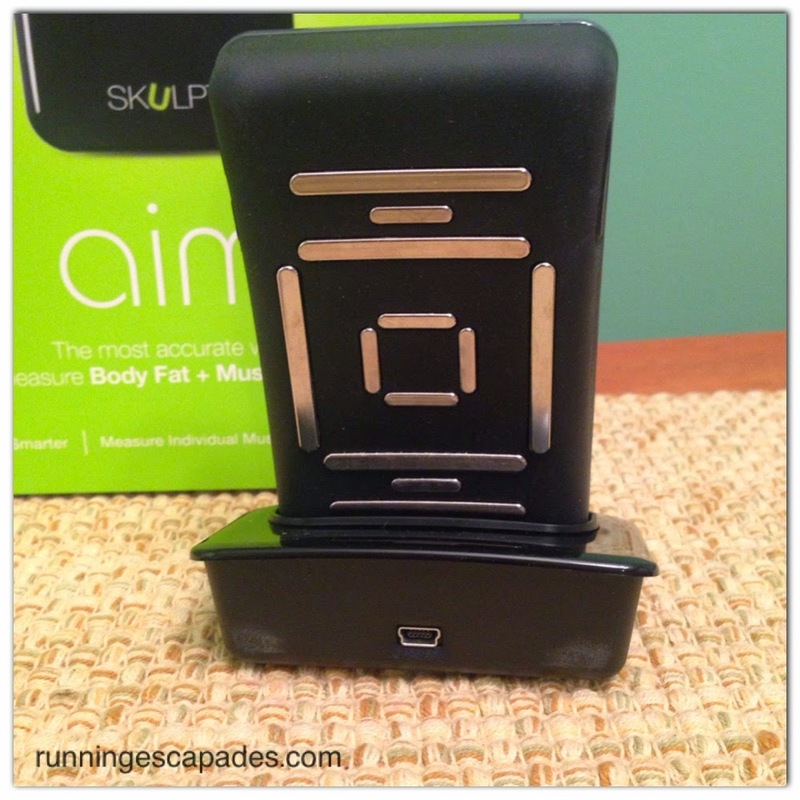 I was selected to use and review Skulpt Aim, a fitness tracker that measures body fat and muscle quality instead of activities, through my affiliation with Raynforest. 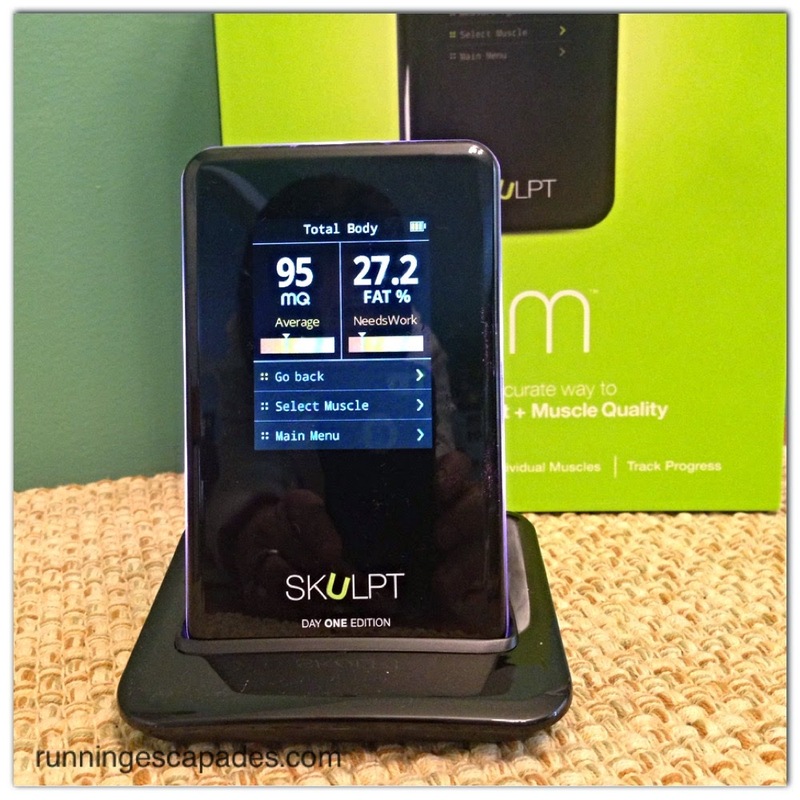 The Skulpt Aim is a device that replaces the pinching tool used to measure body fat by sending a small electrical signal through your skin. The current changes speed as it moves through skin, fat, and muscle. 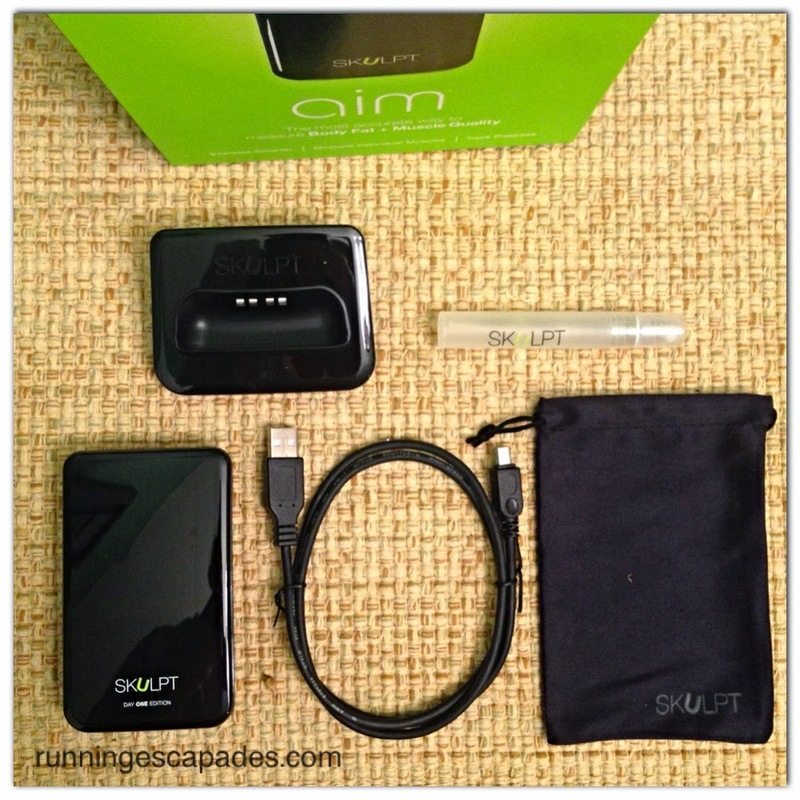 The Skulpt Aim comes with a base charger, usb cord, small water bottle, and convenient storage bag. After charging the device for a couple of hours and downloading the Skulpt app on my iPhone, it was time to take measurements. The device, app, and website all provide thorough instructions (with video) for how to take measurements. You can go step-by-step through all of your muscles or you can opt to focus on just the ones you want. I would recommend getting someone to help you take the measurements. Doing it on your own like I did can be a little awkward. It's hard to reach your backside without creating tension. Also, the sensors must be sprayed after each reading, so I stood on a bath towel, but you could also spray over a sink. My overall total body fat is 27.2% putting me in the needs work category (eek!). 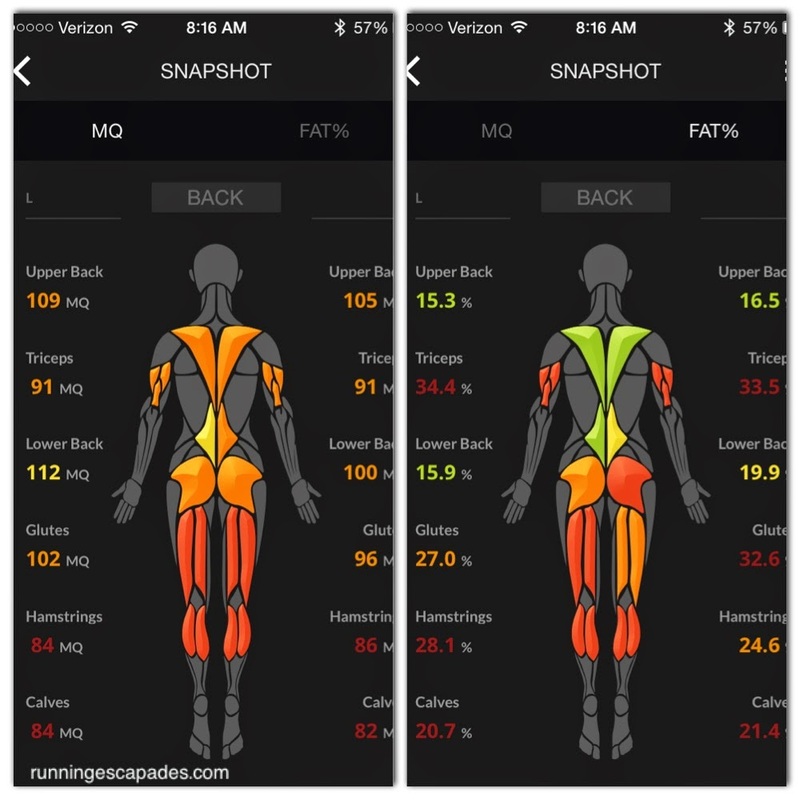 I took a screen shot of the individual muscle numbers. Every week, I will attempt to take new measurements and hopefully see improvements in my muscles. I don't have a lot of meat on my bones, but what I do have isn't exactly filet mignon, you know? While I don't want to become a body builder, I would like to tone up and fall into the fit range. 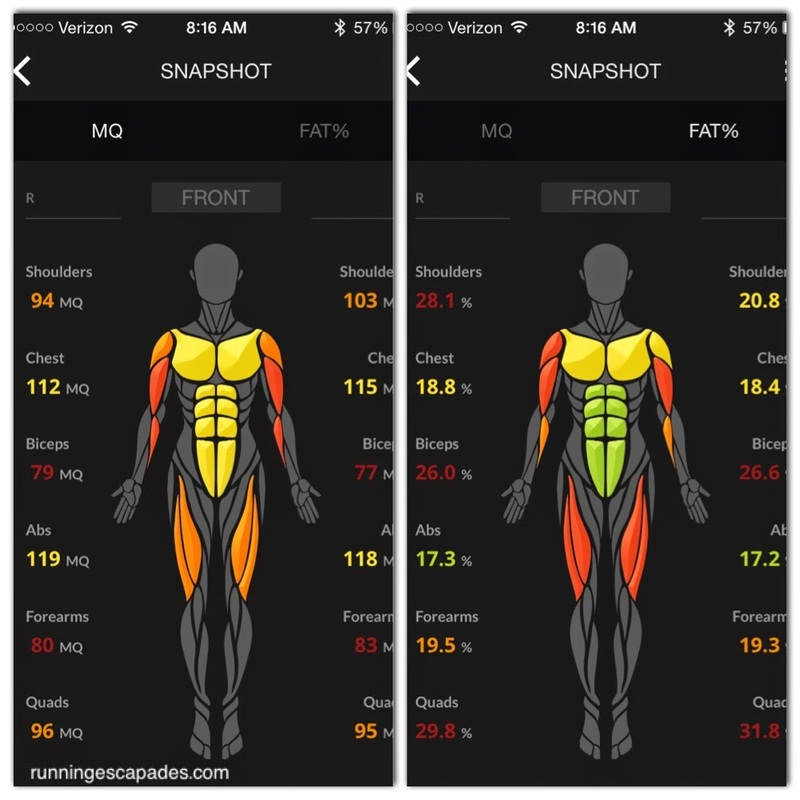 Do you track your body fat and/or muscle quality? Disclosure: I was sent a Skulpt Aim for the purpose of this review, but all opinions are my own. My PT pushed me around during my one session. Instead of focusing solely on strength, he has been testing my balance and landings with lots of single leg and hopping exercises. I'm not that great at hopping backwards on my non-dominate leg, shocker! I've been slowly increasing my run time and hit another milestone this week. My "long" run also included a change of scenery and elevation. 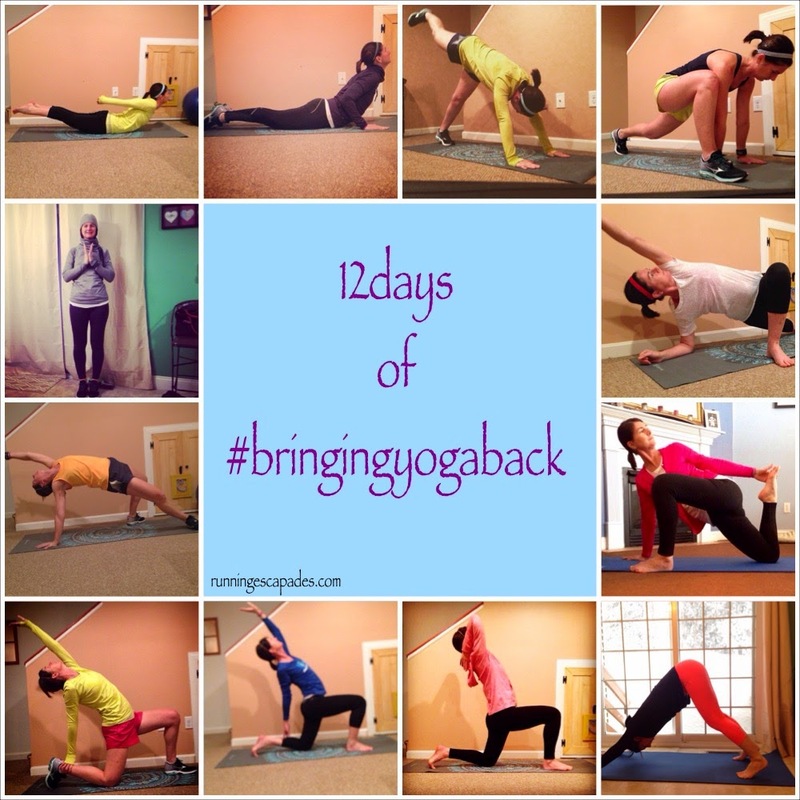 Following yoga poses for 12 days challenged my body in ways that it hasn't been in a long time. 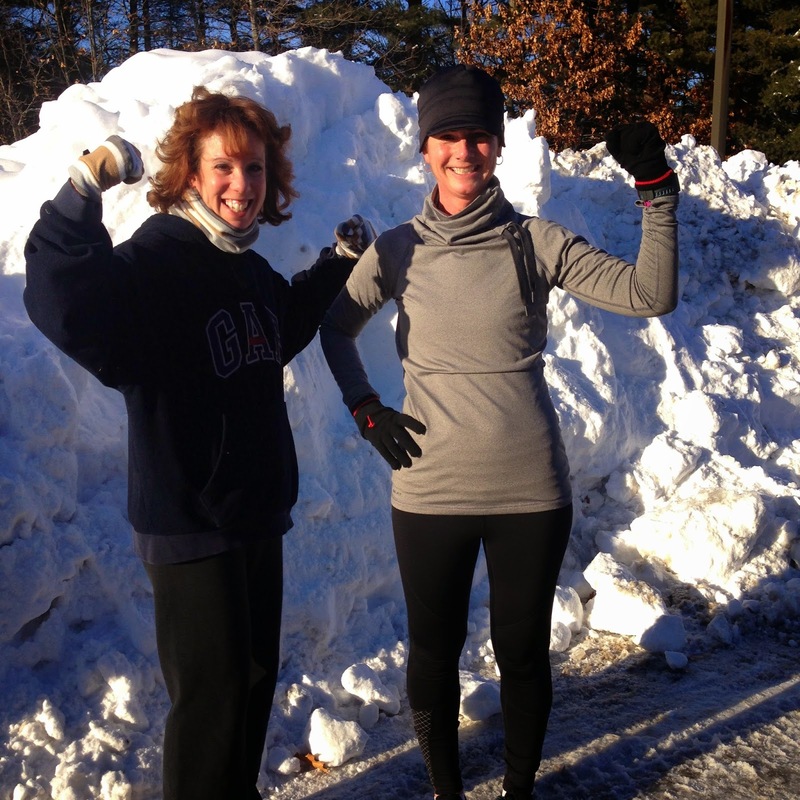 With the nearly 80 inches of snow piled into snow banks lining the roads, there's really no safe place to run outside. Spent 30 minutes on the treadmill and it was the best run I've had in months. My knee is still feeling mazing, but the tight TFL I've been dealing with didn't give me any problems at all. One thing I haven't gotten used to living in NH is the dry, winter heat. My day started with a killer headache that just didn't want to go away. A good run on the treadmill was just the medicine I needed! I joined some fellow MRTT-ers at the Saucony event at our local running store. 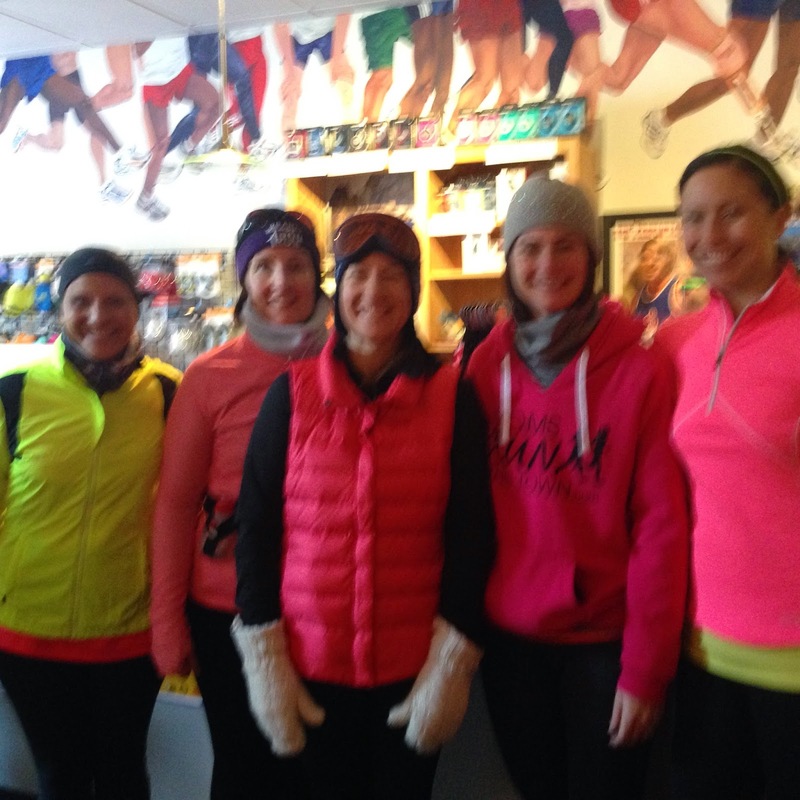 After sharing why we #WantToRun, we bundled up for a very cold 5 mile run. It was my longest and hilliest run since surgery, and I'm happy with how it went. For the past 12 days, I've pushed myself to try poses that I never thought I could do. I learned a lot about my body's strength and flexibility. Check out the pRana goodies and use this discount code leapnpinks15 - for 15% off - valid through 2/28! What boundaries are you pushing? 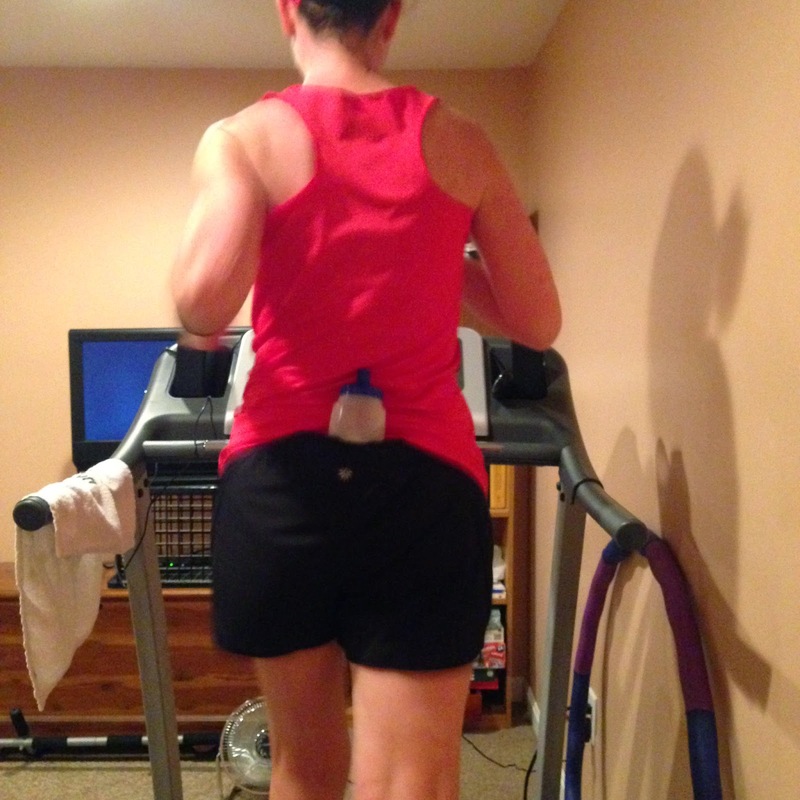 My return to running after knee surgery has come with a new perspective on my runs. 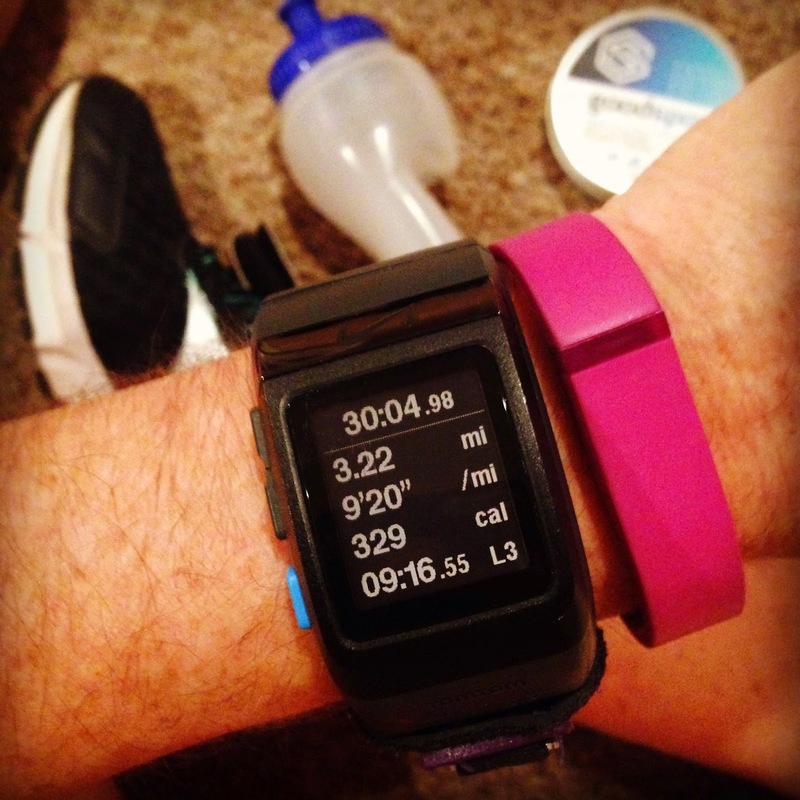 Instead of running for distance, I am setting run duration goals. I used to get all caught up in the miles (which probably led to many of my injuries), but this year one of my goals is to "just run." Running by time reminds me of the time I bought my first brand new car. It was a base model with no extras…not even a radio. Oh, and it was a standard which I had never really driven before. Without the radio, I was forced to listen to the engine of that car as I learned to drive it. 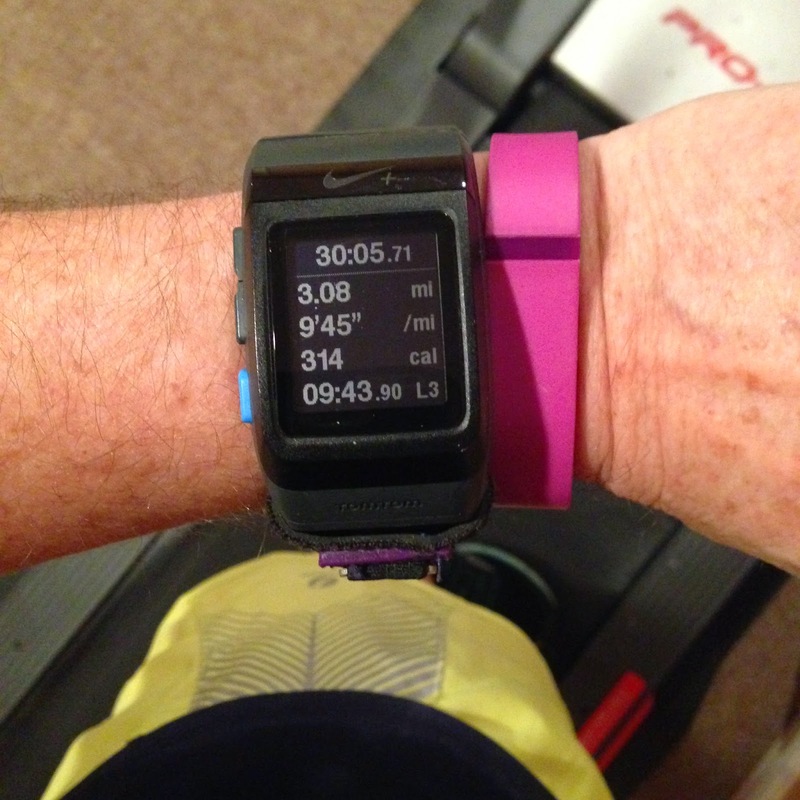 Now, without the distraction of hitting a certain distance, I am learning to drive my runs. Running by time is allowing me to pay attention to my breathing and how I feel. Instead of running the neighborhood loop, we decided to do a snow test of the sidewalks and the side streets. All of the sidewalks were a mess, but the streets were mostly pavement. If the snowbanks weren't crowding the roadways, we could've easily run against traffic and enjoyed the rare sunny, snow-free February day. 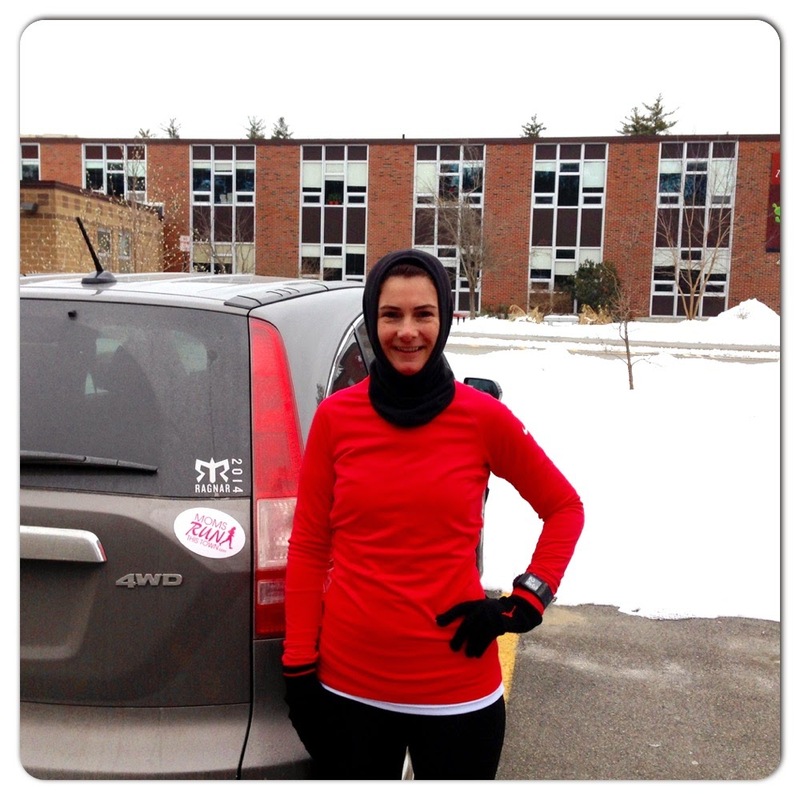 By the time we got back to school, my quads were burning from running on the snowy sidewalks! My chiropractor appointment was right after school and then it started snowing, so I had to make a date with the treadmill. About 20 minutes into this run, I started to feel blah. I hung in there for another 10 minutes before calling it quits. This was just a low energy run (aka I need a break from winter!). It was bitterly cold before the arrival of yet another snow storm. Even if the temperature wasn't a feels like -3, there's nowhere to run as the sides of the roads are lined with 3-4 feet high snow banks! After spending the last couple of days rolling my gluteus medius with a tennis ball as suggested by my chiropractor, my hip felt pretty darn good! So happy with this run and relieved that my knee is not showing any problems as I increase my running time. This 12 day challenge is part of the prAna #TakeTheLeap 30 day yoga challenge. During the 12 days, prAna Ambassador, Michael Fukumura, shares a “Spring Awakening” sequence that offers daily poses. I love being exposed to new poses and seeing how my body responds. I'm learning that I have tight muscles in more places than I expected and that I'm not as strong as I thought I was. Do you for time or for distance? 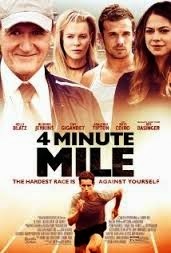 About a month ago, I found out about a great running movie called, 4 Minute Mile. It's an inspirational movie about a high school track star who struggles to stay focused when he has to deal with family problems. His resolve to achieve his dreams are within reach with the help of the right coach until a tragedy threatens to impede his goals. I won't tell you how it ends. You'll have to watch it for yourself to find out if he can run a four minute mile. This movie has a great message about barriers. Personal barriers. The things that hold us back from what we want to achieve. It got me thinking about the barriers in my own life. The fears. My fear of failure, judgement, the unknown, change. While I would like to think (and tell others) that I can get past my barriers, my fears, all on my own…it wouldn't be true. I have been able to chase my dreams and reach my goals because of the coaches in my life. On this Valentine's Day eve, I would like to say thanks to my favorite "coach", mrC. Without you, I would have never run a half marathon (let alone 12! 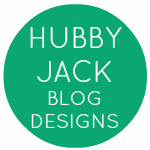 ), tried SUP, or started this blog. Thank you for all of your encouragement and for believing in me. and Friday Favorites at Housewife Glamour. 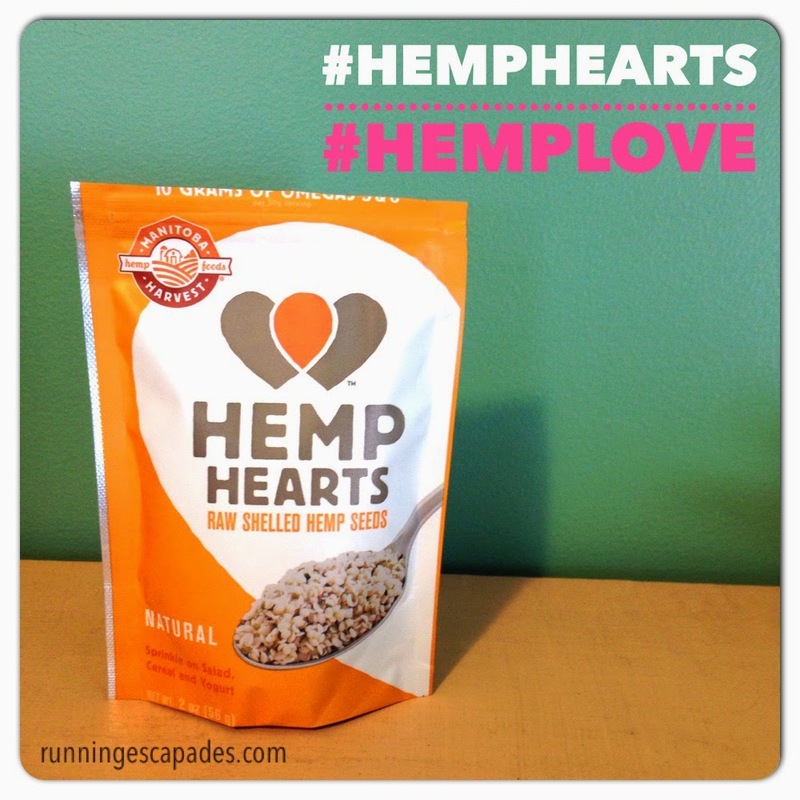 Manitoba Harvest Hemp Hearts Review + Giveaway!! If you're like me, you might not know exactly what hemp is. Well, it's basically a super food! It's considered super because every part of the plant can be used for something. For athletes and vegetarians/vegans, it's a super food because of the grand amount of plant-based protein packed into each serving. Manitoba Harvest focuses on hemp foods. Since I know very little about them and I'm always on the lookout for ways to add more protein to my diet, I was eager to try a sample of Hemp Hearts as part of the Sweat Pink campaign. Hemp Hearts are often compared to flax and chia, but I learned that they are actually quite different. Hemp Hearts have more protein than the other two (10g per 30g serving), but no fiber since the shell has been removed. All three seeds are high in Omegas, but flax and chia have more Omega-3 (sometimes viewed as more valuable) whereas hemp has more Omega-6. Right now, chia and hemp are more expensive than flax. Recommended to be easy to use, I decided to put mine to the test. I sprinkled some into my smoothie. I tossed some in my salad. 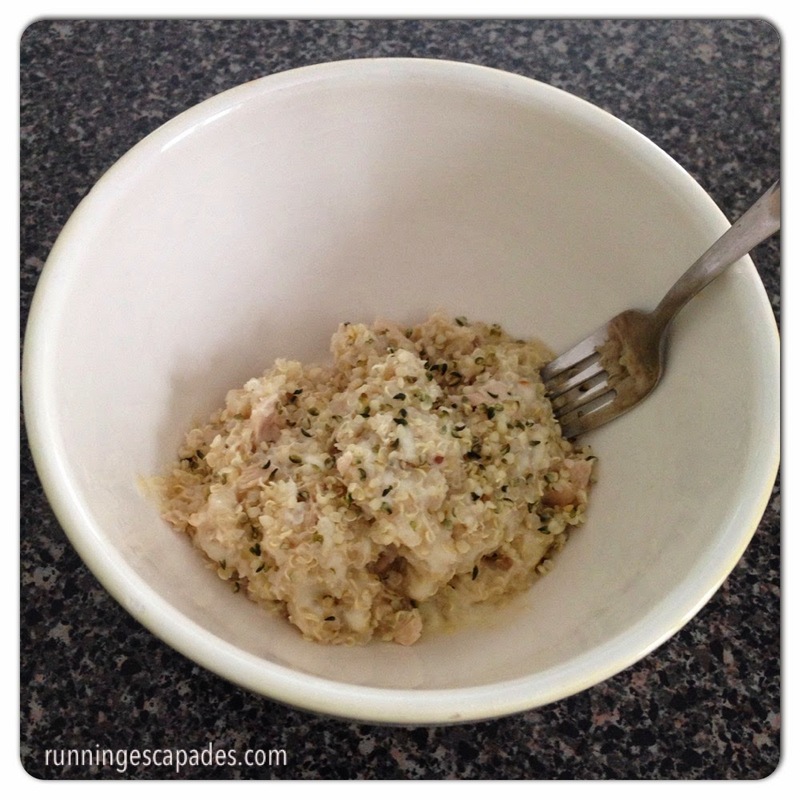 I scattered some in my cheesy quinoa and tuna. 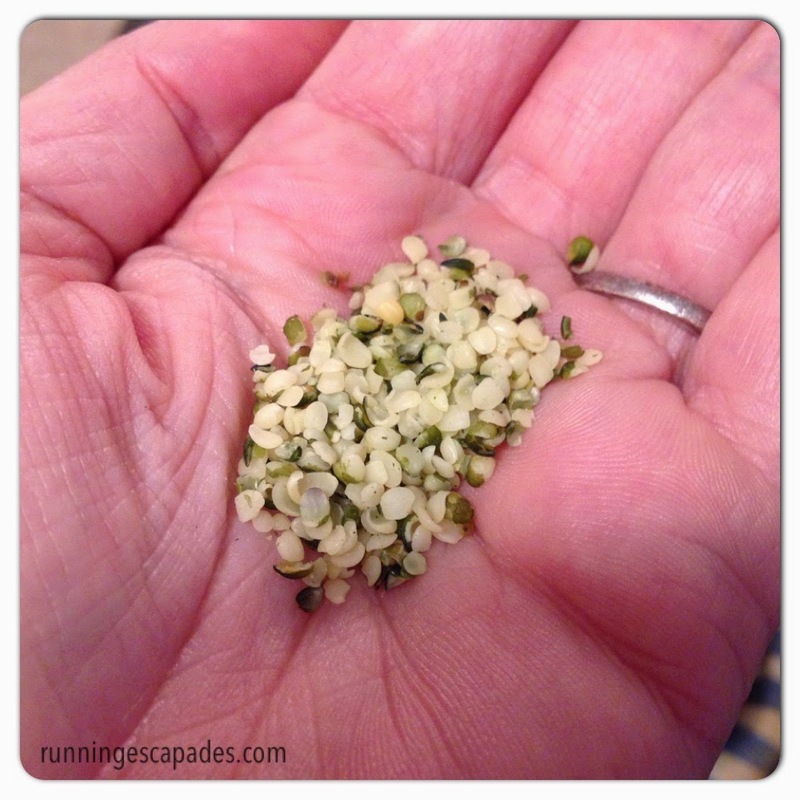 Hemp Hearts have a slightly nutty flavor (like sunflower seeds), but it's not overpowering. To be honest, I couldn't really taste it at all. That's ok with me. I'd rather enjoy the benefits of a super food than have to force myself to eat it! Hemp Hearts can be added to cereal, soup, or eaten right out of the bag. 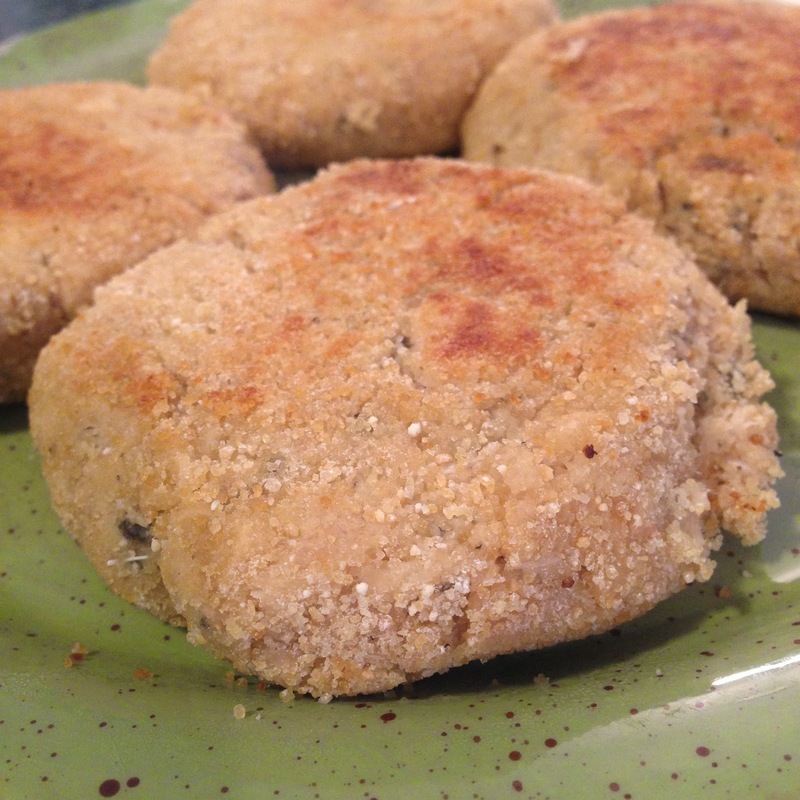 There are a ton of yummy looking recipes on the Manitoba website. 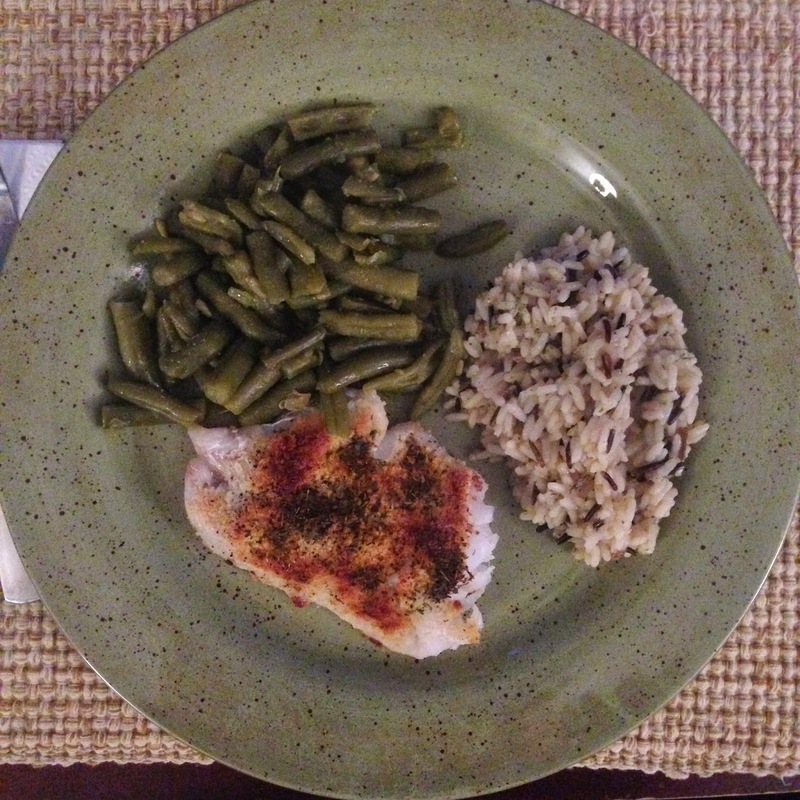 This one of the Hemp Seed Encrusted Salmon is on my recipe-to-try list. And you can print $1.00 off coupons. 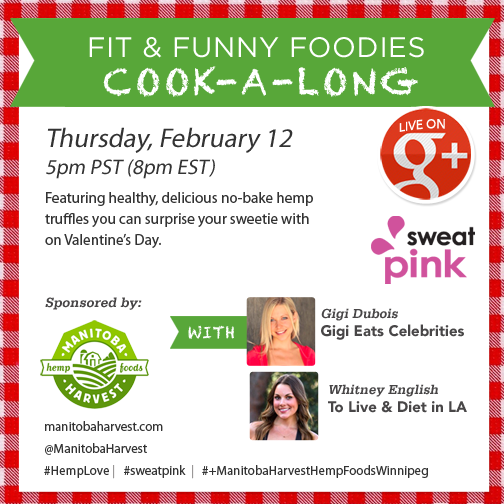 You're also invited to this sweet, protein-packed, live Hangout on Air! I hope you are interested in trying Hemp Hearts for yourself because Manitoba Harvest is letting me GIVEAWAY a bag of Hemp Hearts to one lucky reader (US or Canada)! 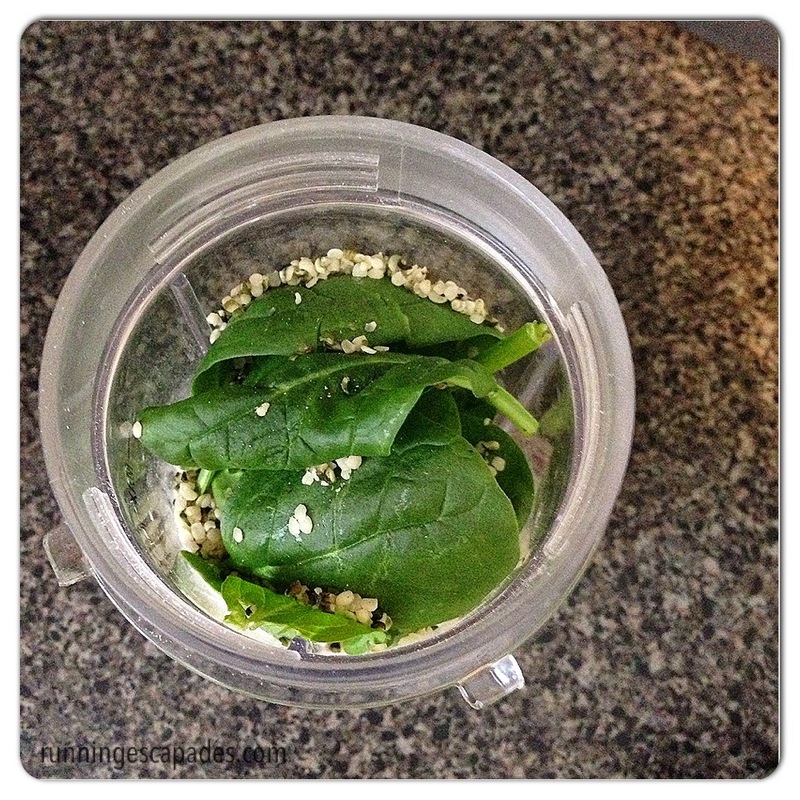 Do you use a super food like Hemp Hearts? This review is part of a Sweat Pink campaign. I received product from Manitoba Harvest, but all opinions are my own. New Tweak on Greek: Yoplait Greek 100 Whips! 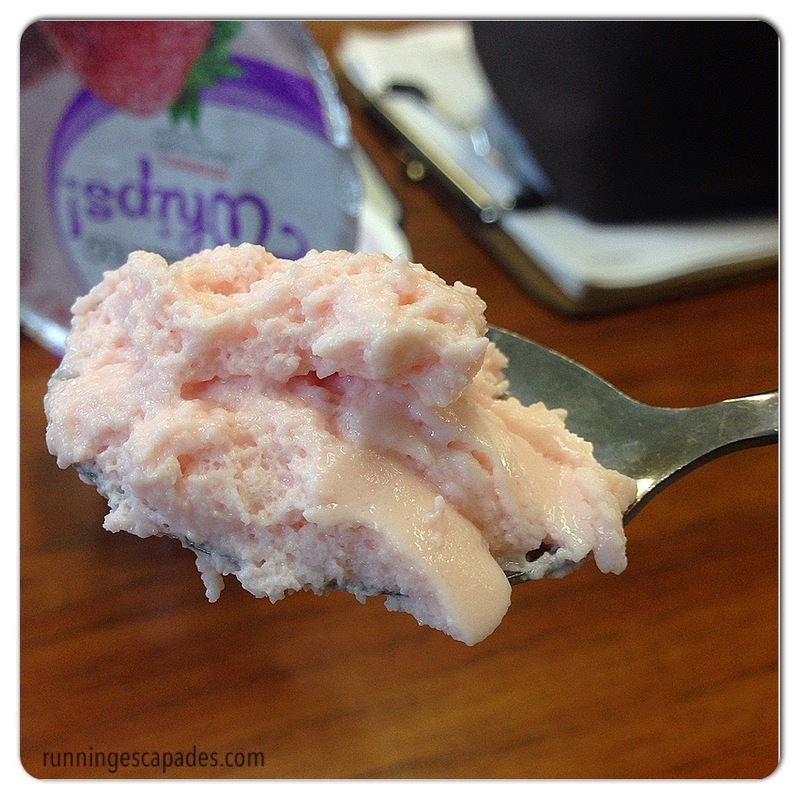 This post is sponsored by Yoplait Greek 100 Whips! I earn a small compensation when you click on a link. All opinions are my own. 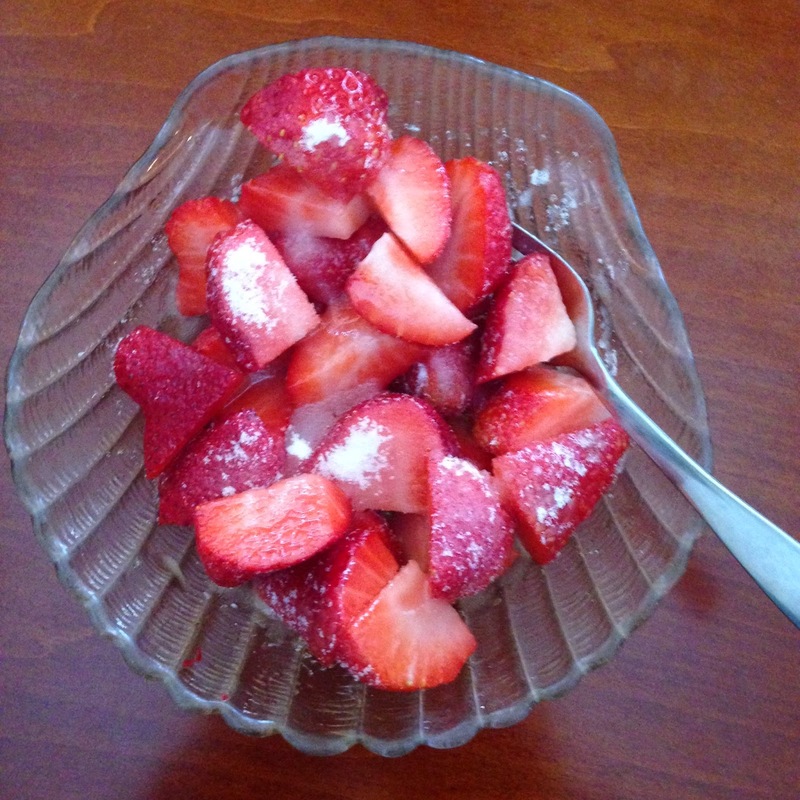 After a good sweaty run, I like a simple treat. 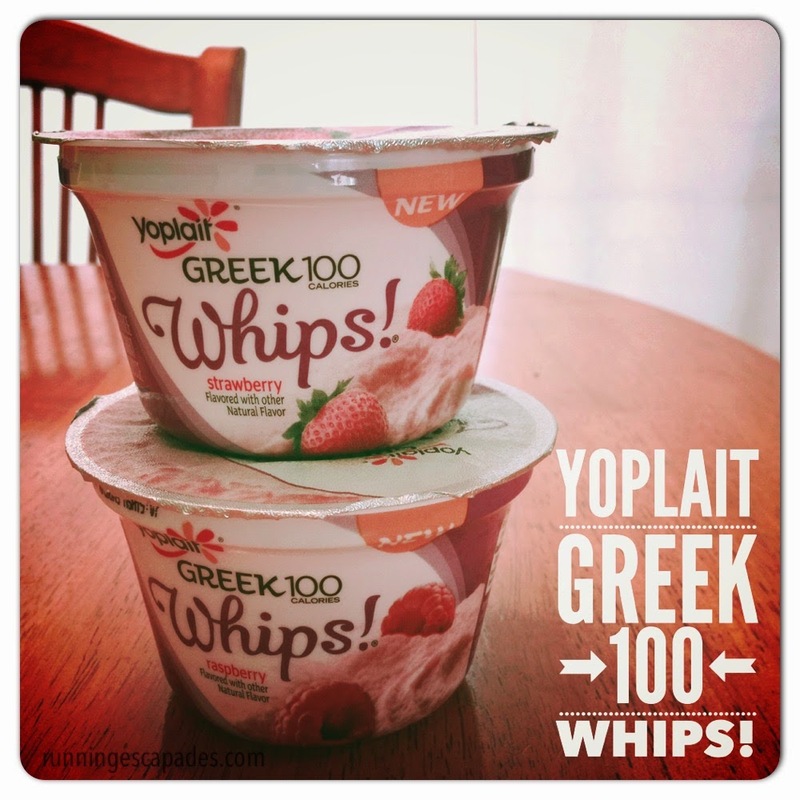 Yoplait Greek 100 Whips! 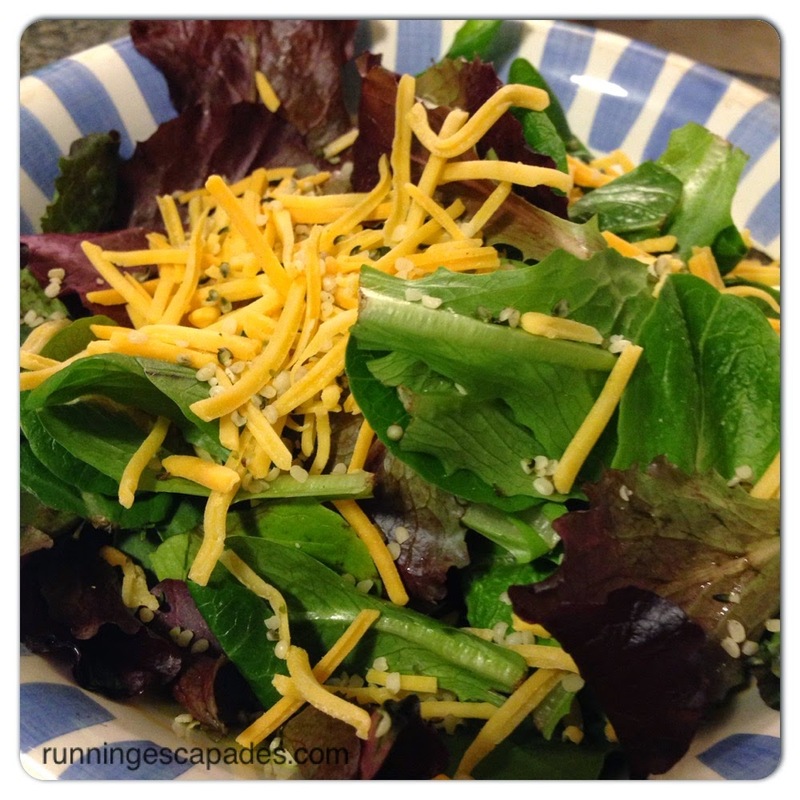 makes it easy to pick healthy snack choices after a good workout. 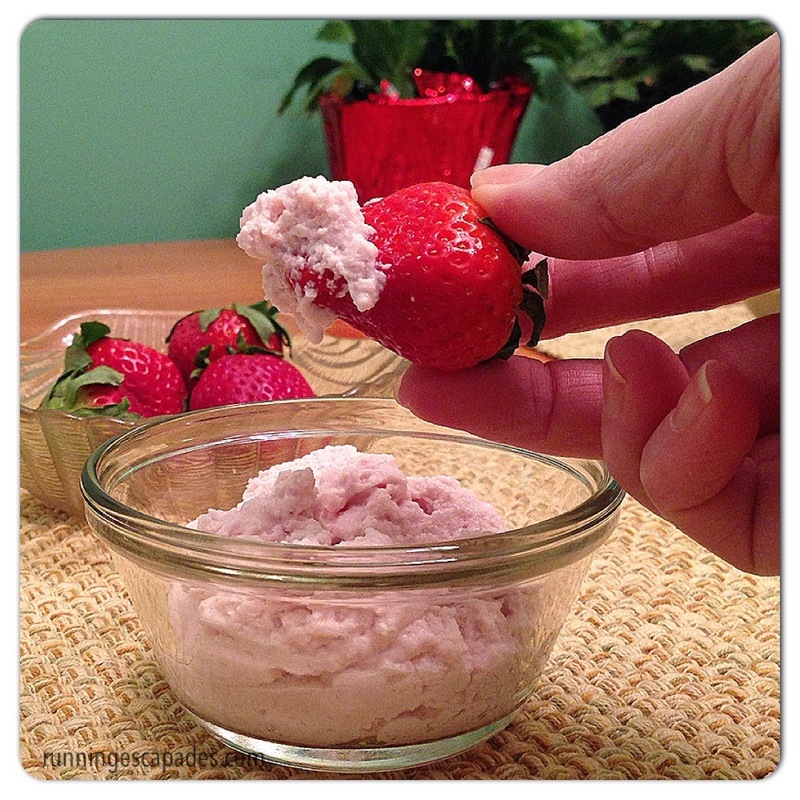 It's perfect for dipping your favorite fresh fruits into the mousse-like texture and you can't beat 100 calories and 0% fat! I also like to toss a Yoplait Greek 100 Whips! 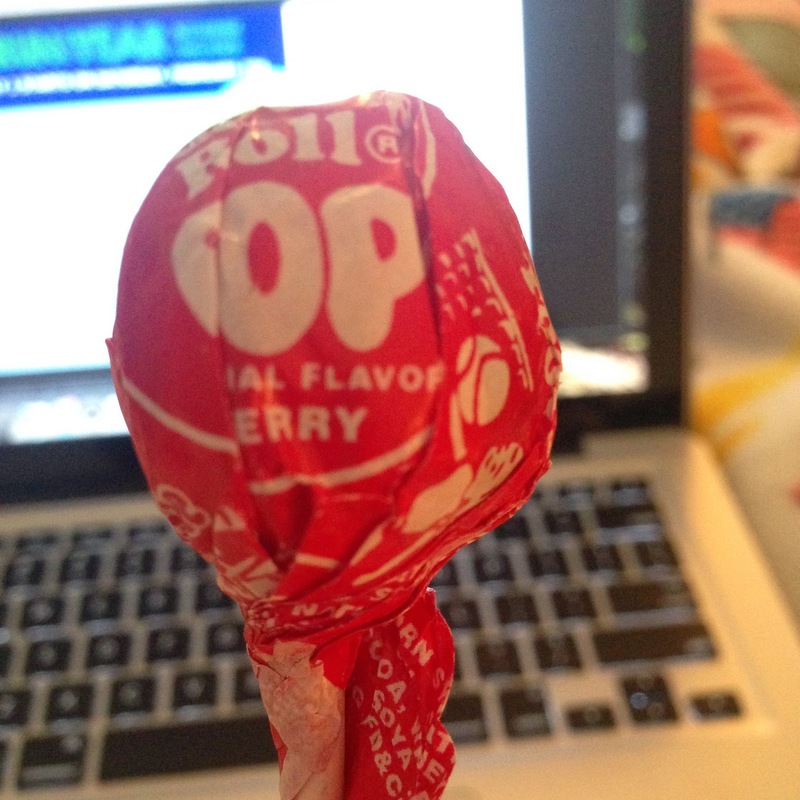 in my lunch bag and enjoy a nice treat before retreating back into the classroom after a 30 minute lunch break. This new yogurt is light and fluffy, but packed with all the protein you'd expect from your Greek yogurt. There's is enough protein to help muscle recovery after a workout or satisfy your appetite until your next meal. When I'm feeling more ambitious, I like to make gluten-free protein pancakes after a workout. 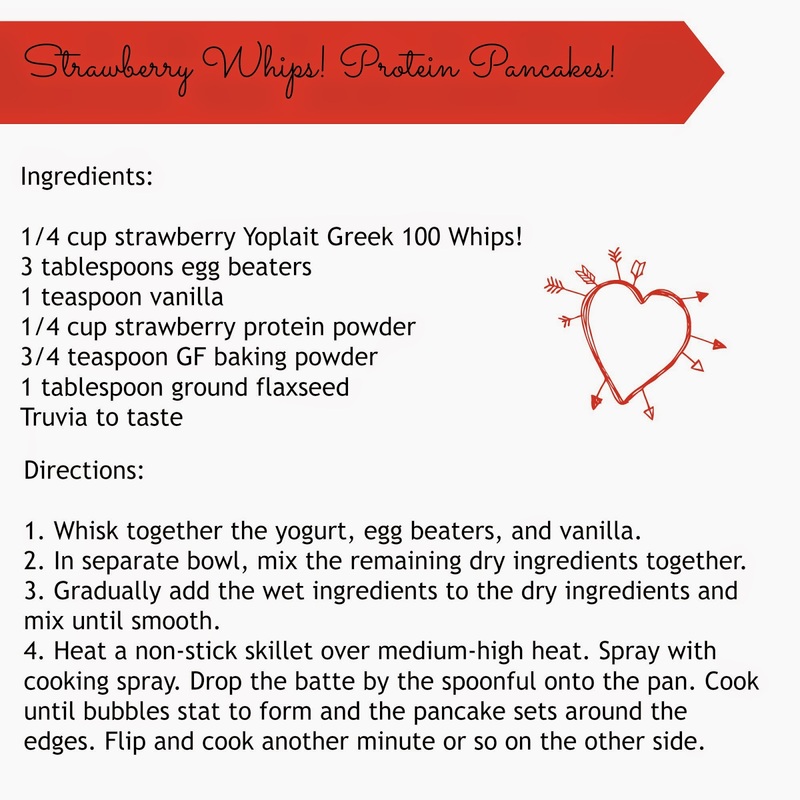 Here's a fun twist on my recipe for a Valentine's Day treat you might make for your favorite person or your kiddos. 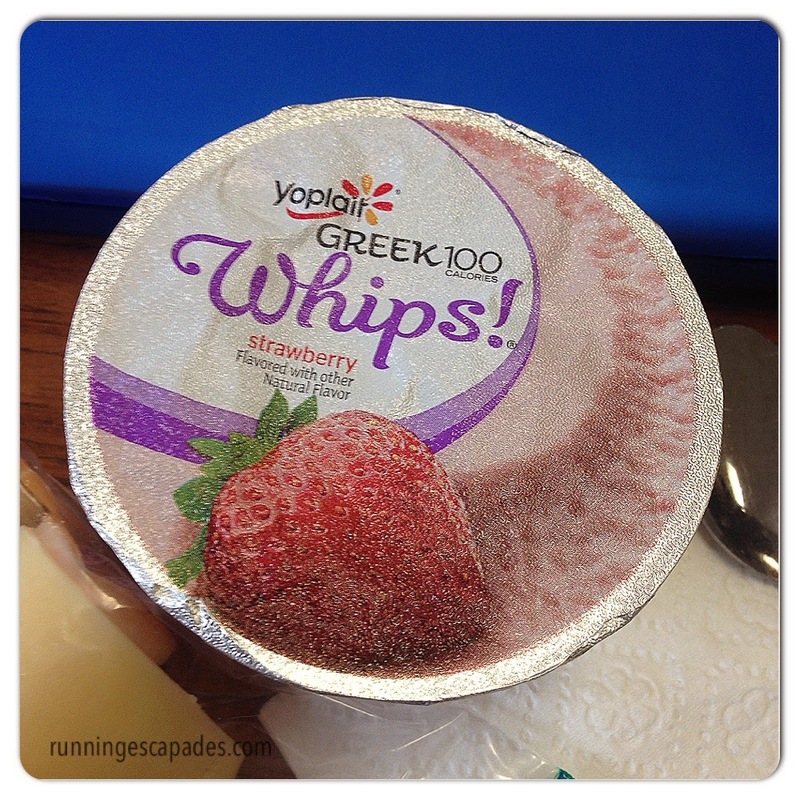 Yoplait Greek 100 Whips! come in a variety of flavors to satisfy your favorite cravings. Take a look at the different flavors here. What's your favorite? Planning to pick some up for yourself? Use this coupon for $1.00 off your purchase! 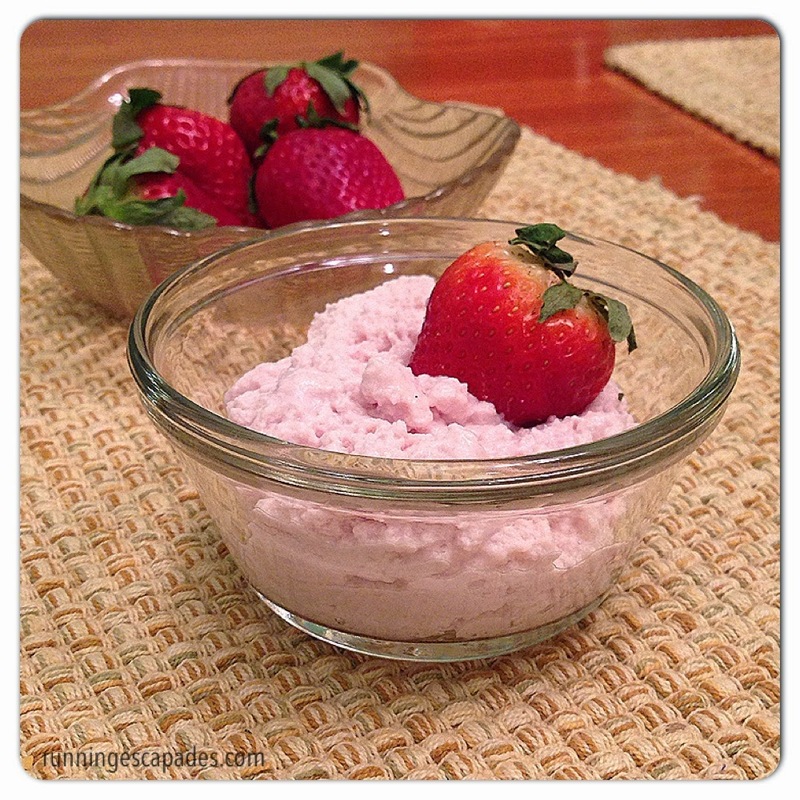 You can also use Yoplait Greek 100 Whips! to whip up some amazing treats. Find amazing recipes here. 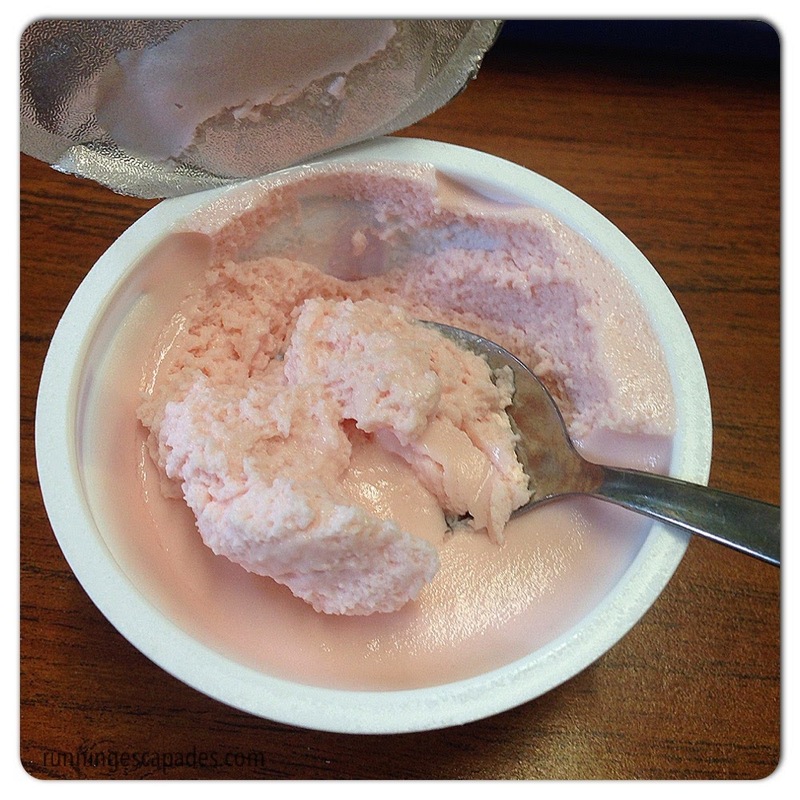 Are you a Greek yogurt eater? What's your favorite post-workout protein treat? 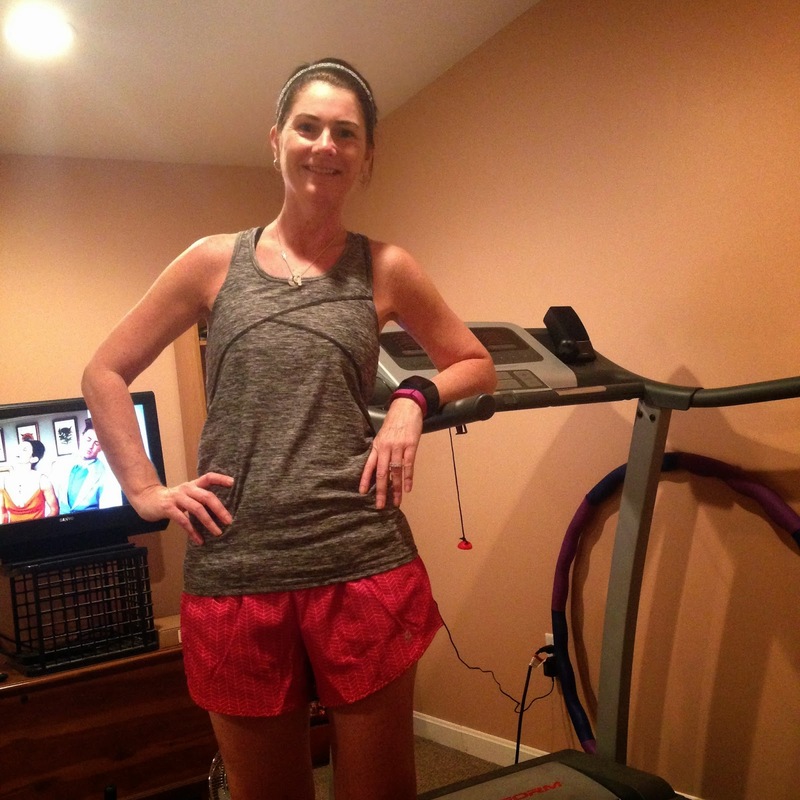 Knee Rehab Week 8: No More Intervals! HELLO! from another very snowy day in New Hampshire. While I love snow days, I'm actually having a love-hate relationship with the weather. Three weeks in a row of winter storms. 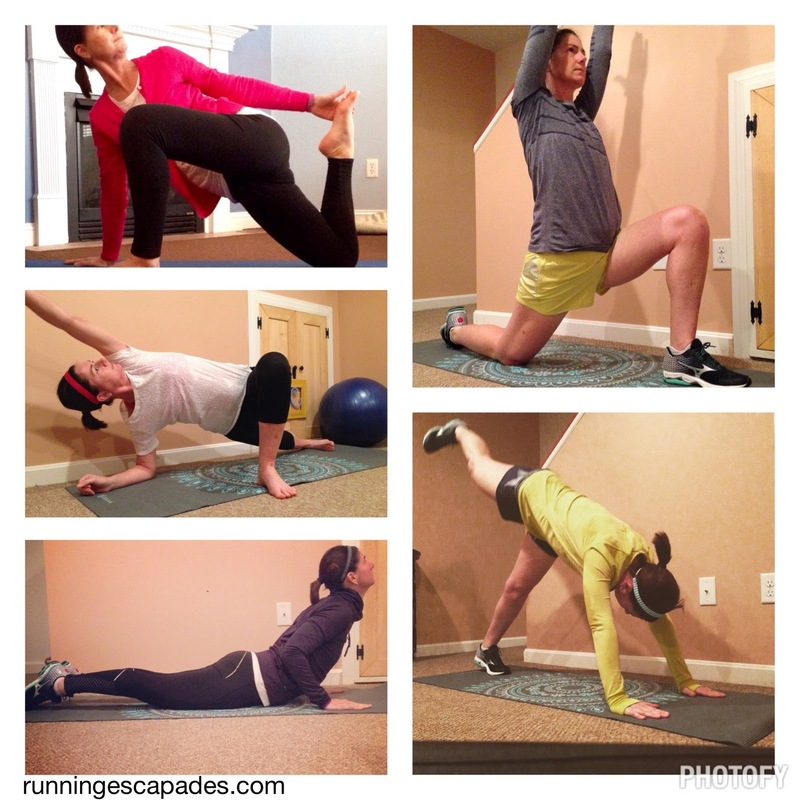 That makes it easy to do at home workouts, but harder to get in an easy, safe run outside. Despite the bad weather, I had a great week of running without intervals! I was doubtful about running outside since the roads and sidewalks were still a mess, but then my PT called to see if I could come in earlier. Problem solved and I ran at home on the treadmill. The day started with an additional 5+ inches of snow falling mostly during the morning commute. My afternoon was wide open since I went to PT during my free period, but somehow I forgot that I wanted to run 25 minutes instead of 20. Too snowy for the MRTT Frozen Booty 5K run, so I hopped on the treadmill instead. I felt so good that I decided to run my new age! This was my longest post-op run. 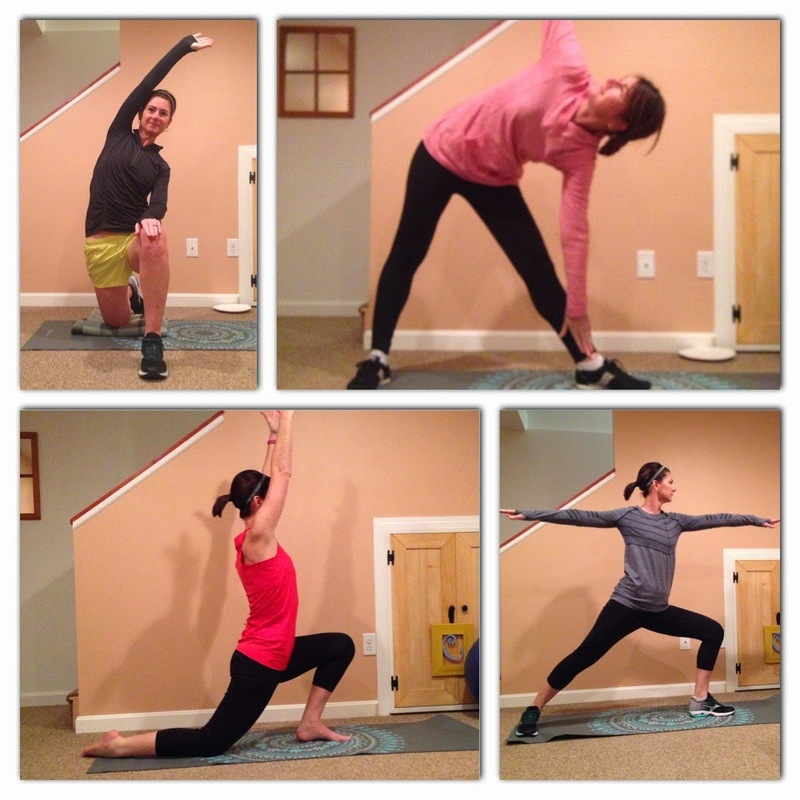 My goal when I joined the #NoExcuses #TakeTheLeap challenge was to use yoga to help with my stretching routine. I'm trying to find poses that will help loosen my tight TFL. I'd love to hear your suggestions! Here's a look at some of my poses from the week. I post all of my daily yoga pictures on Instagram and get great feedback from experienced yogis (Thank you! ), so I know moving forward that I need to make adjustments to my form. Tell me something great about your week! This is what #NoExcuses looks like to me. It's tackling that hill. It's pushing through moments that are uncomfortable. It's embracing the challenges (like knee surgery) and using them as motivation. It's making it to the finish, the top. It's never quitting. #NoExcuses means making good food choices, too. Being snowed in by winter storms can seriously mess with my routine causing me to overeat and just eat plain junk. 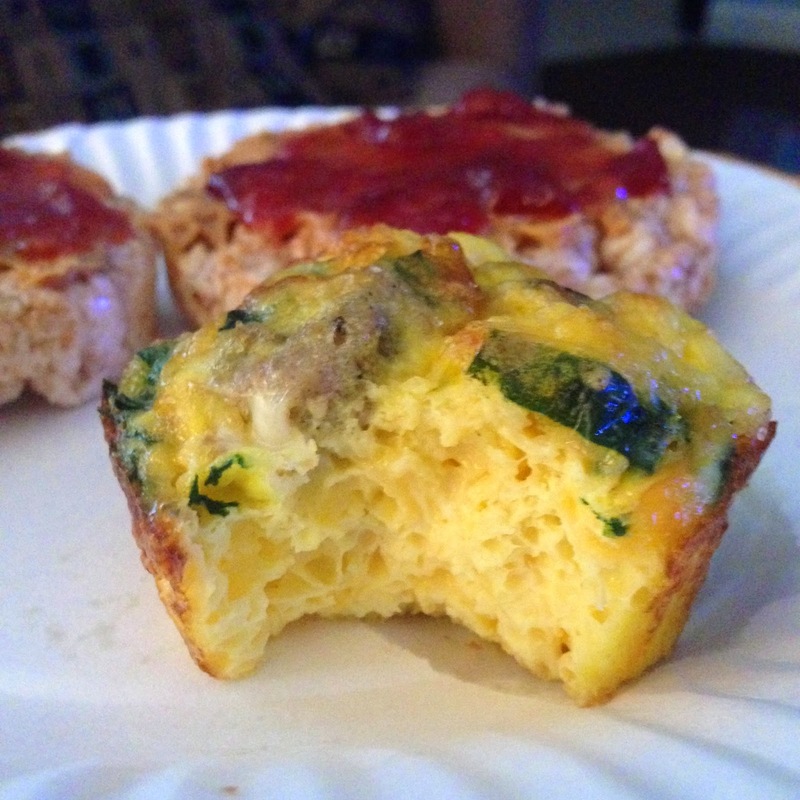 I'm jumping on the WIAW bandwagon today and sharing some of my recent selections. What does #NoExcuses look like to you? 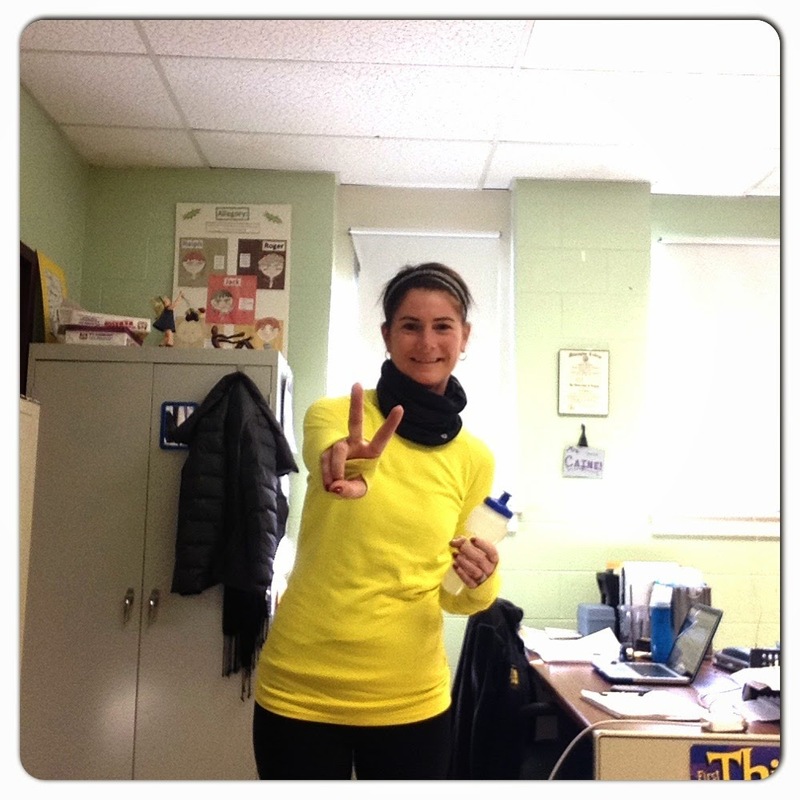 I was tagged by Sandra from Organic Runner Mom and Jen from Running With The Girls to #TaketheLeap. I wasn't going to join this challenge because I don't really know yoga. 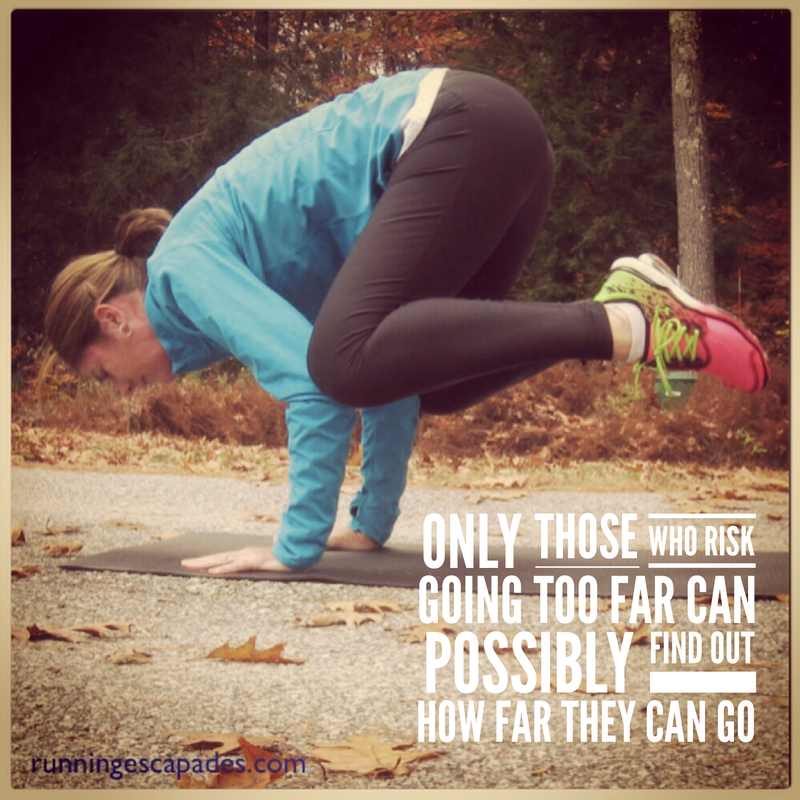 But then I thought, isn't that what the challenge is all about…taking a leap to achieve our fitness goals? So I'm going to use this challenge to help me add yoga stretching to my daily routine. The challenge officially kicked off yesterday with a fun yoga Mad Lib (my answers are in bold). When I think about yoga, the first thought that comes to mind is challenge. Yoga scares me and makes me feel stiff. That’s why I am SO excited to participate in prAna’s Take The Leap 30 days of Yoga Challenge with Sweat Pink. I plan to pose my way to a more flexible and strong 2015! For me, the biggest challenge when it comes to yoga is knowing what I'm doing. 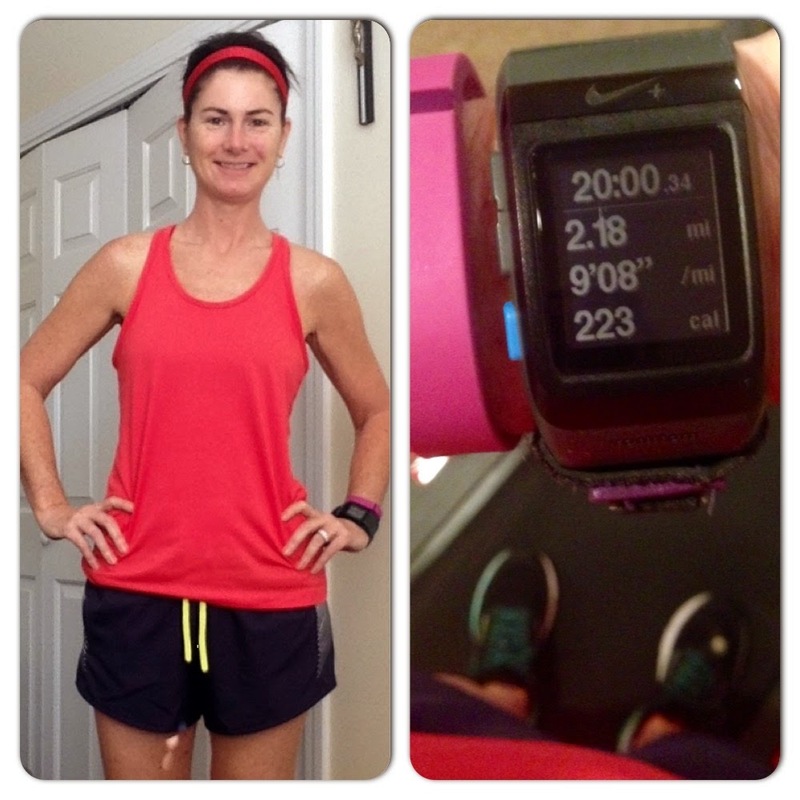 Taking the Leap with prAna and Sweat Pink is a great way for me to find knowledge to become a healthy runner. My favorite place to yoga is outside because it is so beautiful and open. Here’s a photo of me in my very best triangle pose. 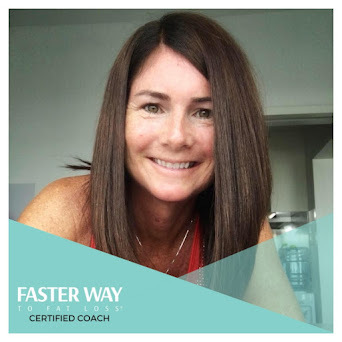 I want these fabulous bloggers to share their very best yoga pose photos, this fun madlib and of course, I challenge them to join me on this fun 30 day yoga journey. If I win I would gift the $500 to Sandra & Jen because they tagged me to join the challenge. Another title for this post could be "playing games with the weather." 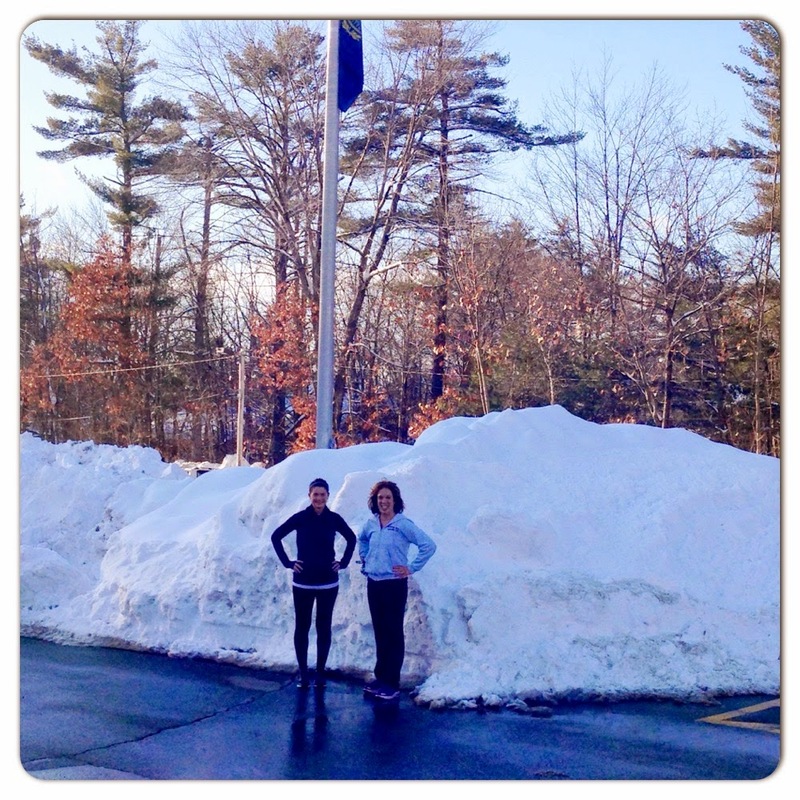 We'd been having a rather mild winter until last Tuesday when Juno pushed into New England. The week became a game of getting runs in before or after the crazy weather! And it continues today with another big storm bearing down on us. 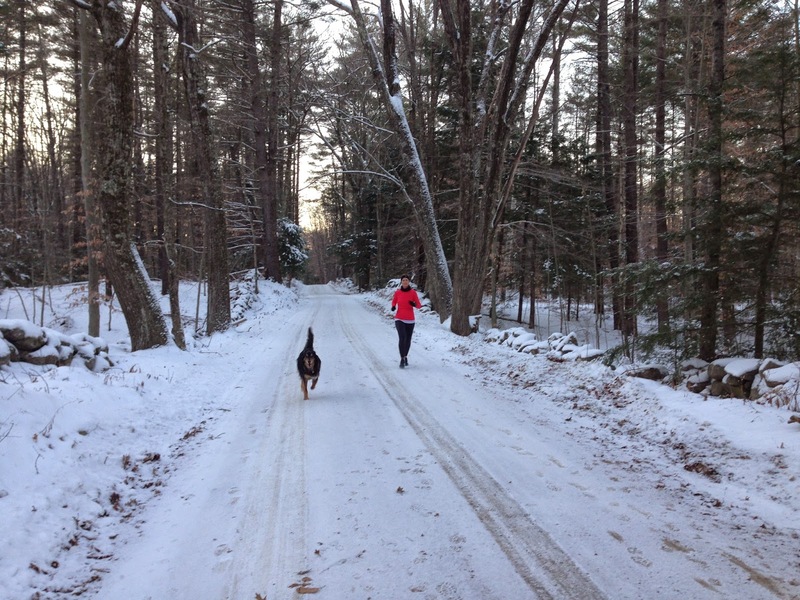 Usually I run on Tuesday, but a winter storm warning meant a change of plans. This was my first time running back to back days since before my surgery (I also ran on Sunday) and it was my first 1:4 interval. I was nervous at the start, but quickly knew that my knee was going to be fine. I could definitely feel my lost fitness. Running 4 minutes as opposed to 3 minutes seems like such a small thing, but my body was telling me I still have work to do! One thing I love about exam week is that I get an hour for lunch. It was a cold day, but the sun was shining which made this an awesome winter run. I turned my watch off at 20 minutes (per PT instructions), but when I saw 1.94 on the display, I had to run a little more through the parking lot to get 2 miles. Why not, right? I put off the run until Sunday hoping the winds and temperature would be more reasonable, but ended up staying home for my first post-op treadmill run. 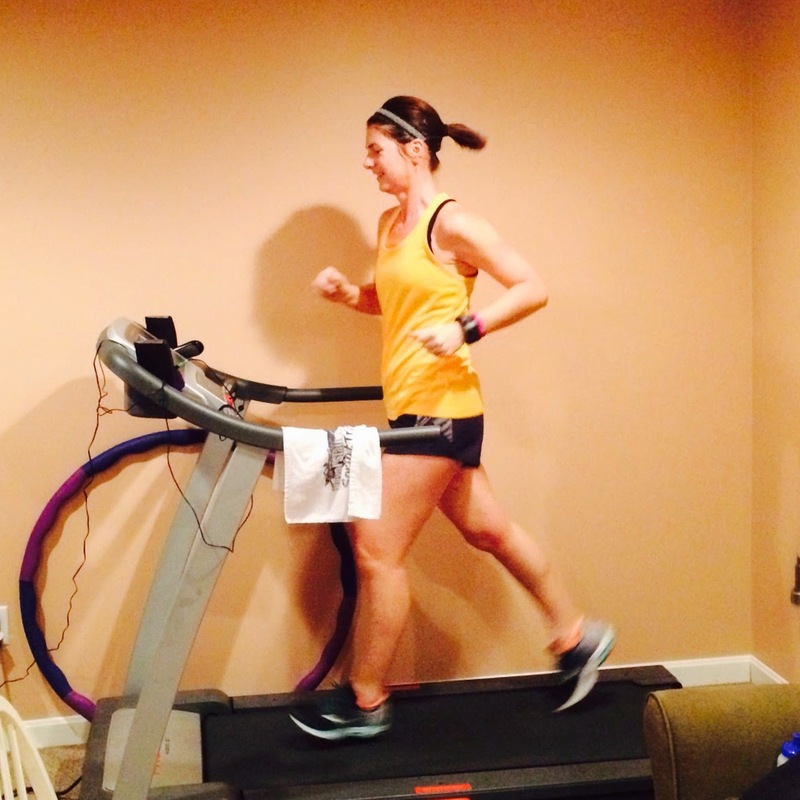 I was nervous: would running on the treadmill bother my knee? How would I know the right speed for the intervals? In the end, my knee felt fine. I picked 3.5 for the walking, and went from 5 - 5.4 for the running. It's not always easy to live with #NoExcuses. Week 3 of the challenge was a true test of not letting the excuses get the better of me. Pushing through the moments and staying focused feels even better when I get to #SundayZenday. How do you get your zen on?